يضمن فندق Southern Ocean Villas الذي رمم في لزائريه قضاء وقت ممتع في ميناء كامبل - طريق المحيط العظيم، سواء جاؤوا في رحلة عمل أو سياحة. إن موقع الفندق الاستراتيجي، الذي يبعد 0.05 km فقط عن مركز المدينة، يسمح للنزلاء بالوصول سريعاً وبسهولة إلى العديد من الوجهات المحلية المثيرة. يشكل هذا الفندق ملاذاَ مريحاً للاسترخاء ويمنح زواره فرصة للاستجمام والتجدد، وهو يقع على بعد خطوات من المعالم السياحية الكثيرة للمدينة كمثل: London Bridge, Loch Ard Gorge, Grotto. يعمل Southern Ocean Villas على ضمان إقامة مريحة لضيوفه من خلال خدماته الممتازة وحسن ضيافته. يقدم الفندق واي فاي مجاني في جميع الغرف, تخزين الأمتعة, واي فاي في المناطق العامة, صف السيارات, غرفة عائلية لضمان الراحة القصوى لضيوفه. ادخل إلى واحدة من الغرف 15 وتخلص من عناء نهار طويل بمساعدة مجموعة كبيرة من الخدمات كمثل تلفزيون بشاشة مسطحة, اتصال لاسلكي بالإنترنت, اتصال لاسلكي بشبكة الإنترنت (مجاني), غرف لغير المدخنين, مكيف هواء الموجودة في بعض الغرف. يقدم الفندق خدمات رائعة كمثل حديقة لمساعدتك على الاسترخاء بعد نهار طويل من النشاط والتجوال في المدينة. يحظى فندق Southern Ocean Villas بموقع ممتاز وخدمات يصعب منافستها. Thanks for a short but sweet stay. 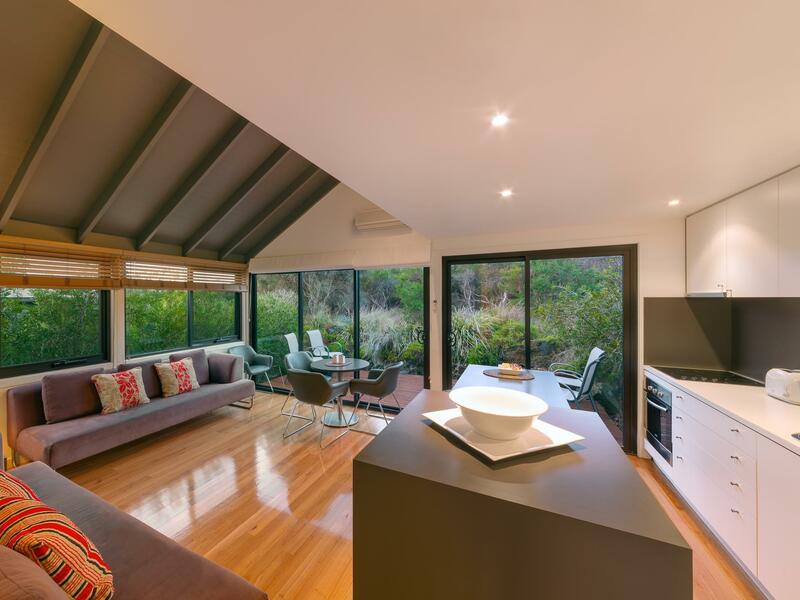 Comfortable and well appointed accommodation with lovely view of the bush from the deck. Cooked up a very nice dinner in the well equipped kitchen. Power was off when we entered the room, and couldn't get TV channels to work as there were no instructions, but staff were friendly and helpful in resolving. Room rate was up there but probably to be expected as it was Australia Day weekend. We would definitely stay again. The location is good. House is clean and full equipped with cutlery for self cooks. Feeling like staying at home. My family members are happy staying here. The only things that we feel bad was the network wifi connection was very very weak and only one can access. Overall is good!! The apartment located at Port Campbell nearby some stores and restaurant, it is quite convenient. The plants and trees surrounding the apartment, just feel like living with natural. The apartment was clean and heater equipped, we felt very warm in it. The reception staff is nice and glad to reply any inquires. The disadvantage is, since the apartment is made by wood, when the wind was blew some trees or plants, it made some noise when the branch hitting the apartment. This has got to be our best stay in our entire OZ trip, we love to cook and the villa is fully equipped with all the utensils that we need for a sumptuous meal... All is good except that some of the lights weren't working... Overall the stay is welcoming, if we were to visit Melbourne again, we will choose to stay here again! By the time we drove from Melbourne, it's already near 5pm. Thankfully we had booked a 2-night stay, otherwise it would have been too little time to enjoy the stay at this lovely accommodation. Kitchen facilities are very well-equipped and the availability of a washing machine and dryer means you can bring lesser clothing and hence more luggage space for gifts / souvenirs to be brought home. Looking from the attic's window, we can see the sun rising on a clear winter morning. Location is great - 12 Apostle, Loch Ard Gorge, London Bridge etc. are pretty close by. Great Ocean Road Visitor Centre is also just round the corner and you can get hold of many touring maps and regional guides that covers other states of Australia. Parking is complimentary for guests and it's convenient just outside the apartment's entrance. As there are only 2 of us, the other room was non utilize. Nevertheless, it has been a nice stay at Port Campbell. The villa was cozy, perfect location to stay overnight if you want to watch the sunset @ Apollo Bay /12 Apostles! And the open space was perfect for intimate party; thanks to ipod dock and open space living/dining room! Then you can retreat into the comforts of your own bed after a wine & cheese night with the crew! Fully equipped kitchen makes you want to add personal touch on your romantic breakfast and the layout of the villa makes you feel like home! Will definitely stay here again !! we arrived at the apartment very late in the evening as we were driving from Melbourne. the staff who handled our check-in process were there waiting for us and have not had her dinner. despite this, she was very helpful and provided information on the nearby attractions and amenities. the apartment is big and clean. we had a very enjoyable stay at this apartment. highly recommended to all travellers! Beautiful villa. Very clean, easy to get to, great location and nice big space inside. The stair case leading up to the bedroom is all open and very steep. It was hard work keeping our very little ones off them. Perhaps bring a baby gate if your kids don’t listen like ours :). Beside that it was cold so we used every heater in the villa available which was nice after awhile, ducted air con would’ve been so much more efficient to heat the place up. Definitely would recommend though we had 2 nights and were very comfortable and happy. Very cosy, clean and well equipped villa. Big and comfortable space for my entire family. The place is fully equipped and the cutlery are all very clean. Near to town and there are many places to have meals nearby. Upon check in, it was informed to us that the baby cot was already in the room and did not mention that there is additional charges so we took it as it was given to us at no charge although I understand at the booking it did mention there is a charge. But shouldn't the staff be clear and transparent that there will be a charge to my credit card? In addition I didn't even open up the baby cot. When i asked for a refund, I was told this was already informed at point of booking. So guys, pls be aware of this if you are travelling with young children. If you don't need the baby cot, return to the reception immediately! Facilities wise, the kitchen is fully equipped but you have to ensure that everything you used is cleaned and placed in the dishwasher or you will incur additional charges again! One of the room has the bed against the window. At night when the wind is strong, the wind will sip through the window and it gets quite difficult to sleep as the cool air was blowing on the face. Great for families or groups up to 6 max. 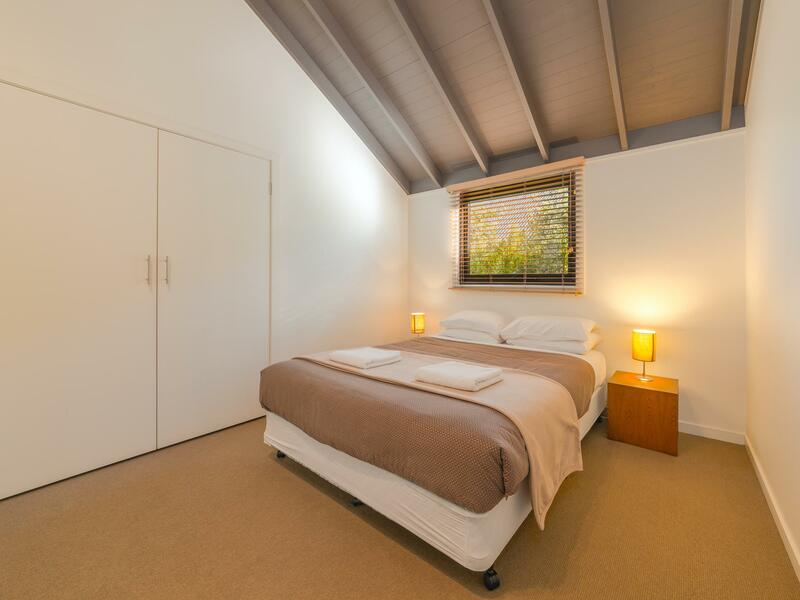 Clean, comfortable and conveniently located along Great Ocean Road. Ideal for a good night's rest while on a road trip. We booked the price under AU$400 and need to charge additional $25 for each child. It only has 2 queen size bed room. If more peoples, need to stay in second floor. The second floor is not an exact room, just put several beds on. The living room and kitchen also small than the villa which we stayed in the days before. It looks too small for 6 people inside. There's 3 rooms but only 1 toilet, so it will take a long queue if you travel in big group. Two of the rooms are queen-bed. The last room is actually upstair and it is open (no door), kids like it. The reception counter close at 8pm. So be sure to check in before 8pm. The Villa is near Port Campbell where twelve apostles located at. Room is two level with 3 bed room, clean and nice. there is a balcony at level 1 which family can have BBQ and breakfast. Staff is friendly. There are mini market and restaurant nearby with 5 min drive. The location is conveniently located about 10mins drive to the 12 apostles. I've booked a deluxe villa that can accommodates 8pax. Not much view from the villa tho.. Restaurants are 2-3mins drive away. Take note if you are driving down to port Campbell and to reach there approx about 7pm or later in the evening, some restaurants are probably closed or food are sold out in the restaurants even before its closing time. Pack your own food if possible. Classy interior , comfortable beds. Self sufficient unit. Very good location if you drive (and we did) , 2min drive to petrol station/food/food/food. We stayed in unit 10 with 3 bedrooms. Wouldve been better if there were 2 bathrooms. If i get to choose accomodation again i would prolly choose the cheaper options within the same area. Not that its bad but the cheaper options nearer to food n petrol station looks good too!